The proof is in the protein with Dr. Elsey's cleanprotein Chicken Formula Grain-Free Dry Cat Food. Inspired by the protein levels found in natural prey, this food optimizes your cat’s appetite and body mass through simple, high quality ingredients. 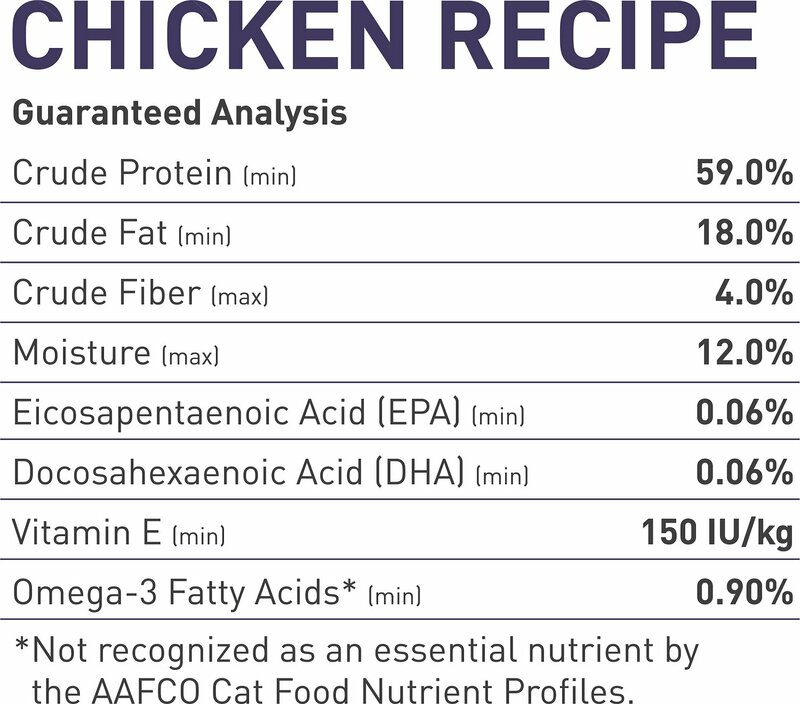 Including real chicken as the first ingredient, as well as plenty of vitamins and minerals, the idea is to promote a healthy and active lifestyle for all cats—because the right diet can go a long way in satisfying your cat’s appetite and keeping him feeling great. Over 90% of protein is animal-based to promote a healthy body mass and a satisfied appetite. Primary ingredients are among the highest biological value proteins available. Lower glycemic formula delivers just 4% of energy from carbohydrates. Ingredient profile is no-to-low oxalate to help prevent calcium oxalate crystals and bladder stones. 100% grain, gluten and filler free formula that’s full of vitamins and minerals like taurine and omega 3 fatty acids. Chicken, Dried Egg Product, Pork Protein Isolate, Gelatin, Chicken Fat (Preserved With Mixed Tocopherols), Flaxseed, Natural Flavor, Salmon Oil, Potassium Citrate, Calcium Carbonate, Fructooligosaccharide, Calcium Carbonate, Choline Chloride, Vitamins (Vitamin E Supplement, Niacin Supplement, D-Calcium Pantothenate, Vitamin A Acetate, Thiamine Mononitrate, Pyridoxine Hydrochloride, Riboflavin Supplement, Vitamin D3 Supplement, Biotin, Vitamin B12 Supplement, Folic Acid), Minerals (Ferrous Sulfate, Zinc Oxide, Calcium Carbonate, Manganous Oxide, Copper Sulfate, Iron Amino Acid Chelate, Manganese Amino Acid Chelate, Zinc Amino Acid Chelate, Copper Amino Acid Chelate, Sodium Selenite, Cobalt Carbonate, Ethylenediamine Dihydroiodide), Potassium Chloride, Mixed Tocopherols (Preservative), Taurine, Salt, Rosemary Extract. For Kittens, offer up to 2 times the daily recommended feeding for Adults. For Gestation/Lactation, offer up to 4 times recommended daily feeding for Adults. Adjust the amount of food you serve based on the age, size and activity level of your cat. Food should be fed at room temperature. Allow 7 - 10 days to make the transition by adding a little more Dr. Elsey’s Clean Protein each day and decreasing the cat's current food. Dr. Elsey's litter and cat food are veterinarian-formulated by Dr. Elsey himself to help cats live happier, healthier lives and to give cat owners the best options for their pets. Precious Cat Litter is made to be soft on paws and tough on odors, with a range of options that encourage proper litter box use. And Dr. Elsey's cleanprotein kibble and wet food deliver the high protein levels cats instinctively crave for optimal health. 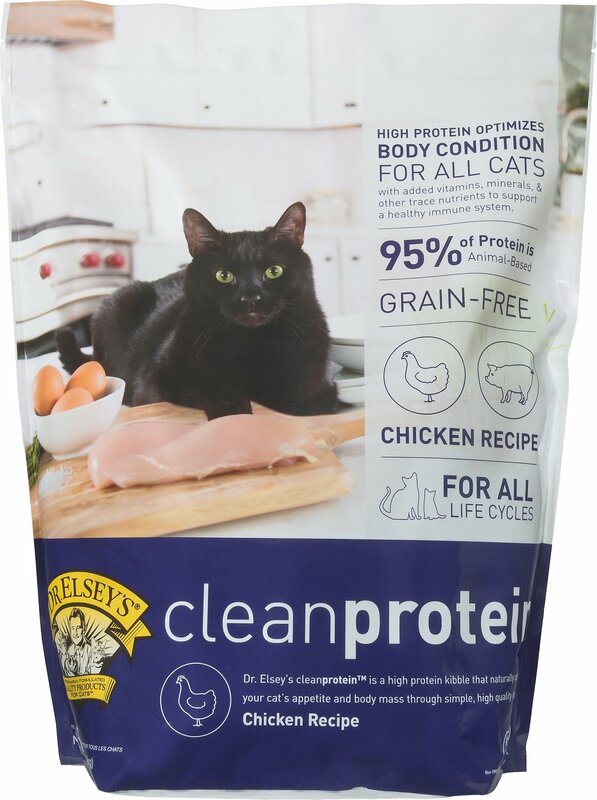 Dr. Elsey's cleanprotein recipes offer high-quality, animal-based proteins as the primary ingredient to optimize body mass and help your cat maintain an ideal weight. Taking inspiration from the protein levels found in natural prey, cleanprotein satisfies your cat's appetite naturally with some of the highest biological value proteins available. Each formula is grain-free with no fillers or artificial preservatives. Dr. Elsey's innovative litter formulations entice kitties to go inside their litter boxes, which makes for happier pet parents. They absorb moisture and odors quickly, and all scoopable litters use premium clay for maximum clumping ability. Which Litter Works for Your Cat? Benefits A fresh scent is released when this litter comes into contact with moisture. Combines heavy, non-tracking Classic granules with a medium-grain clay to prevent moisture from seeping to the bottom. Natural, chemical-free prairie grasses help reduce stress behaviors like scratching and marking. Allows you to monitor kidney function, diabetes and hyperthyroidism by weighing urine clumps. Natural silica sand with hydrolyzed herbs that helps address urinary tract problems in senior, arthritic and overweight cats. Benefits Available in silica gel and clumping clay formulas, this litter helps control respiratory disease and reduce stress. Has a particle size long-haired cats prefer, and the crystals won't stick to your cat's fur. Natural herbal attractant made especially for kittens with an ideal granule size for small paws. The original formula with a larger, denser particle size that clumps hard and stays in the box. Made for litter box problems with a natural herbal attractant and an ideal texture and particle size. Dr. Bruce Elsey and his wife, Kathy, founded the company in 1987 with the hope of making products available to help pet parents with the litter box issues Dr. Elsey frequently treated. He's been practicing as a feline-only veterinarian for over 35 years, and he found that non-use of the litter box was the main reason cats were mistreated or abandoned. Starting with Cat Attract litter, Dr. Elsey set out to change the outcome of many cats' fate and help them and their owners live happier, healthier lives together. My cats eat less of this food than they did of Hill’s. I’m delighted to be feeding less and having them satisfied! My male cat wolfed this food down like he was starving. Wow! Since it’s a bit costly for me, I’ve also slowly introduced a second food: Instinct Ultimate Protein (95% real Chicken). As they transition to these new foods I’m slowly removing the Hill’s and adding more Dr. Elsey’s and the Instinct. Soon the Hill’s will be gone. What I noticed: cats are friskier and satisfied with their food. I was feeding grain free wet food in am & pm, but there is less and less interest. I would recommend Dr. Elsey’s. Both of my cats love this. I was surprised that my picky Siamese eats it right up! The size and shape is just right. I was worried about the carb content and general low quality of the diet cat food they were on before. It’s amazing that they are able to get the carb content almost as low as wet food. I also notice that my heavy cat eats less and seems more satisfied on this! No more constantly begging for food. Since EVO was discontinued I have been seeking a high protein dry food that the 4 kids would like. Because of the protein levels it is weighty and cats eat less by volume than higher carb products. My cats have always been allowed to free feed from a choice of a couple of dry foods with wet twice a day but no one is getting fat as one reviewer mentioned (I suspect some cats overeat, others don't). I trialed this along with another high protein food but they seem to like this one a little better and so appears to be the winner. My cats love to have dry food treats after their last daily meal. I'd been using a popular store brought brand which I knew was not healthy for them so I was delighted to see Dr. Elsey offered a healthy alternative. The cats love it so I will be signing up for automatic deliver each month. My 1-1/2 year old picky eater LOVES this food, more than any other kind! I have to mix it with wet food just to make sure she gets enough moisture, because she would eat this exclusively if I let her. Smells like a delicious "people" meal. Cat switched food very easily, which was very unusual. He went straight for it and i really go for the natural ingredients. My cat who is extremely picky when it comes to dry food just loves this one. 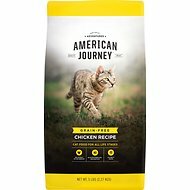 The ingredients are great & I love that it comes in a 2 lb bag so that my cat can eat the entire bag before it gets stale; he refuses to eat dry food which has been opened too long no matter how tightly it is resealed & usually I wind up with an abundance left over but not with this one. Good to the last bite! Finally a low carb kibble with all the right stuff! I mix it up with canned Applaws. My cats are getting a balanced diet with all the moisture they need. Highly recommended.